The country was saddened by the recent death of former First Lady Barbara Bush, who will be remembered for her grace, poise and wit, making her one of the most popular first ladies in U.S. history. She was known for her no-nonsense disposition, treating everyone she met along the way with dignity and respect. She was authentic, with a down-to-earth manner, and will be remembered for refusing to dye her white hair and admitting that her signature strands of pearls were fake and intended to cover up her wrinkles. I had the great pleasure of meeting Mrs. Bush many years ago as a young public relations professional working for Comcast. The company was supporting the Barbara Bush Foundation for Family Literacy – a nonprofit with a goal of empowering families through literacy – by producing and airing public service announcements (PSA) about the organization. The video production crew and I were invited to the home of Doro Bush Koch, daughter of former President George H. W. Bush and Mrs. Bush, to video record the PSA during a fundraising luncheon. Of course, my colleagues and I were all nervous about meeting a first lady and anxious about working with her. But she immediately put us all at ease, making a casual joke about how we would need to enlarge the script on the teleprompter for her to read it. I will never forget the kindness, composure and grace she displayed that day. "The most important yardstick of your success will be how you treat people; not just family and friends, but strangers you meet along the way,” Mrs. Bush often said. 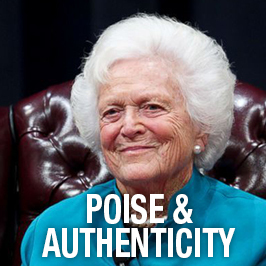 We can learn from Mrs. Bush that poise comes from humility and an assured sense of self. She never let fame, wealth or privilege go to her head, and she acted gracefully in some of the most difficult situations. As members of the legal community, we too are often faced with difficult situations, and it is how we handle those situations that speaks to our true character. How can we as attorneys and legal marketers learn from the life of Mrs. Bush? Get to know your clients, what their concerns are, and how you and your firm can help. Listen to what your target audience is talking about, particularly on blogs and social media sites such as LinkedIn, and consider how to best relate to them. Your comments on social media should speak to your audience in a manner they will understand. Carve out time to engage and interact with clients and colleagues to show them you are there to help and offer insights in a timely manner. While clients are looking for someone to help solve a problem, personality matters. An attorney’s bio page is often the first interaction with a prospective client. Law firms today are rethinking the attorney bio page to demonstrate their attorneys’ depth and experience in a particular industry or practice area in a way that will resonate with their target audience and set the stage for building a relationship. Firms are looking for ways to use attorney biographies to communicate more than just a résumé and a list of related matters or news items. They are developing these pages to create a personality for both the attorney and the firm. One of the most-effective ways to do this is to rethink the style of photograph. Consider replacing the dated headshot with more-captivating images of attorneys in their natural environments. Political life, like the legal industry, is often harsh, with late hours and stressful situations. It’s not always easy to remain calm, but the more prepared you are, the less nervous you’re likely to feel. Organization is crucial to preparing and winning cases and remaining in a calm, persuasive state. For Mrs. Bush, honesty equaled respect. She was brash but endearing. She never wanted to be intimidating or aloof. She was loved by millions of Americans who admired her quiet leadership, the family she built, and her grace and integrity. We can all learn from her well-lived life. Need guidance on how to present yourself? Contact me, Lisa Altman, at laltman@jaffepr.com.